We are committed to protecting your privacy and keeping your information secure. This policy provides transparent information about the personal information that Annika Hall Guides collects, and the ways in which Annika Hall Guides uses that personal information. Annika Hall Guides processes Personal Data as a Controller, as defined in the Directive and the GDPR. If you have any questions or concerns, you can email us at info@annikahallguides.com. 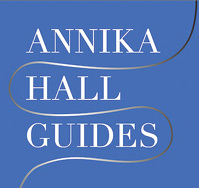 Annika Hall Guides use MailChimp to manage our newsletter and bulk customer communications. We will store some of your information, including your email address, IP address and certain information about the email links you click within the emails we send you, on a Mailchimp server. Annika Hall Guides will use software and trusted third-parties to fulfil our contractual obligations to you in the performance of our services and completing transactions. By requesting information or delivery of a service and product, we process your data under the lawful basis of contract. Annika Hall Guides will ensure they have contracts with them that confirm your data will be processed following GDPR regulations. Annika Hall Guides may disclose your personal information to the extent that it is required to do so by law, in connection with any legal proceedings or prospective legal proceedings, and in order to establish, exercise or defend its legal rights. Annika Hall Guides has a Data Governance Policy in operation and will take reasonable technical and organisational precautions to prevent the loss, misuse or alteration of your personal information. Annika Hall Guides will store all the personal information you provide on its secure servers. We will never provide access to our databases to a non-trusted third party detailed in this policy. An external PCI compliant payment gateway handles all payment transactions. You may request details of personal information which we hold about you, by applying in writing to Annika Hall Guides, 23 Mimosa Street, London, SW6 4DS, United Kingdom or email us at info@annikahallguides.com. We will take all reasonable steps to ensure your personal information is current and accurate. If inaccurate or incomplete data is identified, we will takes steps to correct the data, or remove securely and confidentially. You have the right to instruct us to remove incomplete personal data held. Should you wish to request incomplete data removal, please do so in writing to Annika Hall Guides, 23 Mimosa Street, London, SW6 4DS, United Kingdom or by email to info@annikahallguides.com. You can see a schedule of the cookies we use in Schedule A. Should you feel there may be a problem in how your data has been handled, you should contact Annika Hall Guides by email to info@annikahallguides.com. Should you still not be satisfied you have a right to complain to the Information Commissioner’s Office (ico.org.uk). _dc_gtm_<property-id> 90 days Contains campaign related information for the user. If you have linked your Google Analytics and AdWords accounts, AdWords website conversion tags will read this cookie unless you opt-out.